Home Dealers Watch My Back! Actually I’m just kidding. What I really meant to say is: Watch your back! The human knee is not well designed for all the sport and work activities we expose it to. Anyone who has suffered from a knee injury can testify how crippling this injury can be. However, with an injured knee, we can usually still somewhat function and should it go out, knee replacements are available. The situation with our backs is quite different. Any injury to our backs can be extremely painful and often we are flat out. Our backs are our life lines. Without a healthy back we do not function, it’s as simple as that. 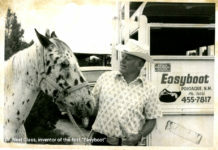 Photo by Susan Kordish, Cowgirl Photography. 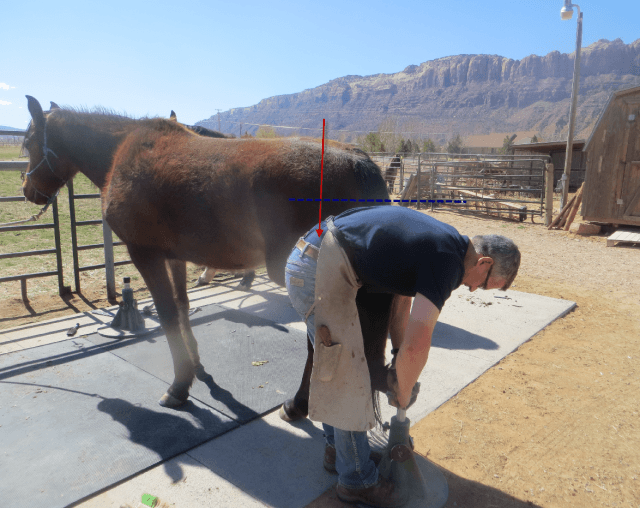 Hoof trimming and applying hoof boots like the Easyboot Glue-Ons is hard on our backs. 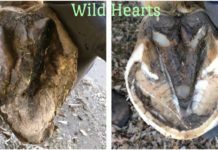 Back pain and compressed discs are all too common among professional and amateur hoof trimmers and farriers. 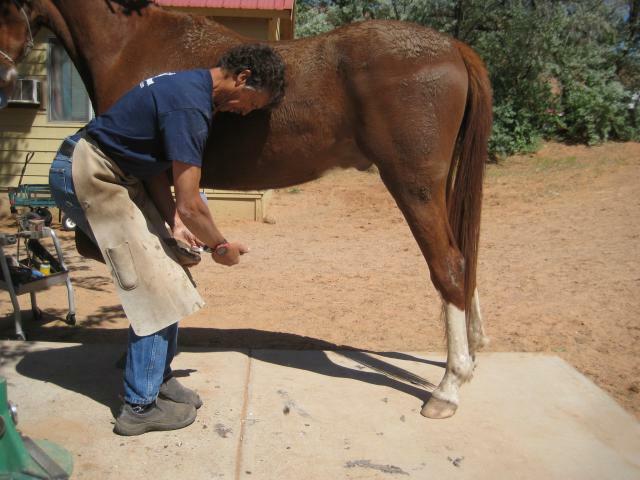 When our backs are sore, it takes the fun out of trimming our horses feet and we cannot do a good job. There are some practices that will save our backs for years and allow for pain free work. 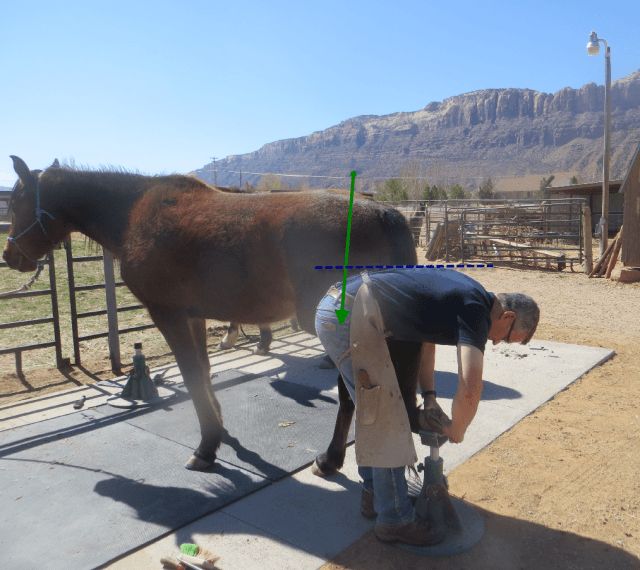 In my blog last month I wrote about the benefits of using a hoof jack. 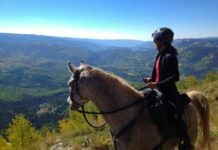 If you missed last month’s blog, you can read it here: Five Ways To Get The Most Out Of Your Hoofjack. 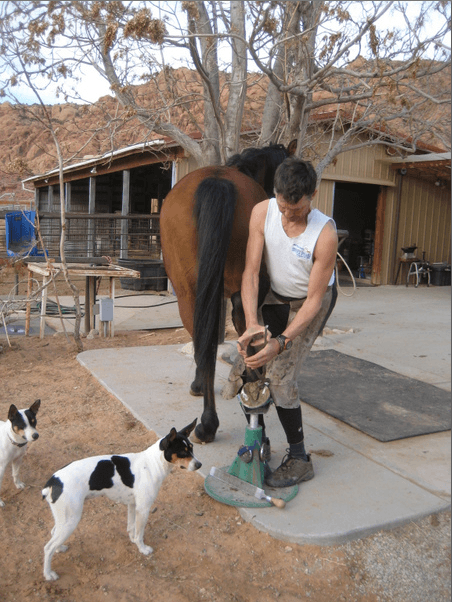 Using a Hoofjack, I can keep my back straight and relaxed. One of the most important things to remember is to always use proper posture. That means keeping your toes pigeon toed, your ankles and knees flexed and your back straight. We want to balance over our feet and work our quads to keep us in the posture, not bend our backs. With a straight lower back, I can trim all day long without suffering any back pain. where the back is bending forward, purple line helps evaluate the bending of the back. Flexing from the femur (hinging torso forward). The green arrow shows the origin of flexing. The back is much straighter which results in less strain on the lower back. Remember to keep your muscles toned. A lot of joint injuries happen because agonist and antagonist muscles are not balanced and not of equal strength. With skiers many knee injuries happen, because their quads are so much stronger compared to their hamstrings. They overpower the hamstrings and under the right circumstances the uneven forces acting upon the knees result in a torn ACL. Their is a similar relationship with our backs. Our back muscles should be of equal strength to our core or stomach muscles. Plank exercises are great to strengthen our core muscles. Stretching the body is equally important. Even when doing our best to save our backs, strains will occur. The vertebras of our spine are cushioned with discs made of cartilage. When bending, loading or twisting the spine repeatedly only in one direction, these discs will get compressed in one direction which can lead to pinched nerves, lack of flexibility and arthritis. A regular exercise program that incorporates pilates or yoga can be extremely beneficial. Not all of us have the opportunity to do that so here are some of my simple stretching exercises. They only take minutes and allow for a healthier, pain free back. 1. Between trimming, I place my hands on my hipbone and push my pelvis forward. Hold for 30 seconds, the relief is instant. 2. After trimming I hang from a bar or tree branch. This lets the weight of your body stretch and elongate your back. 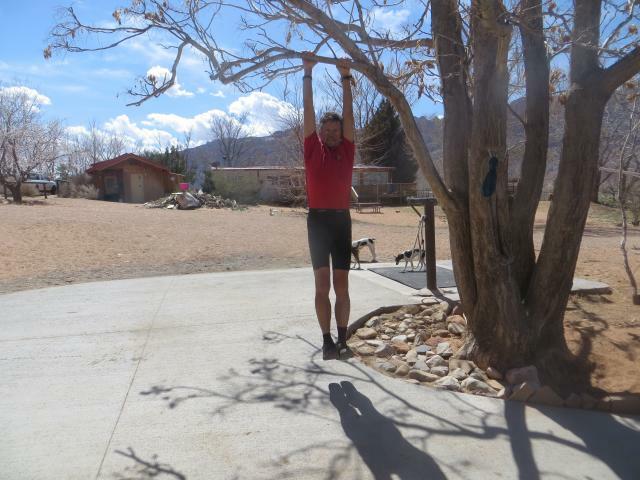 For better effect, stretch your heel towards the ground while hanging. 3. Do the plow. In the beginning, you might not get your feet to touch the ground. 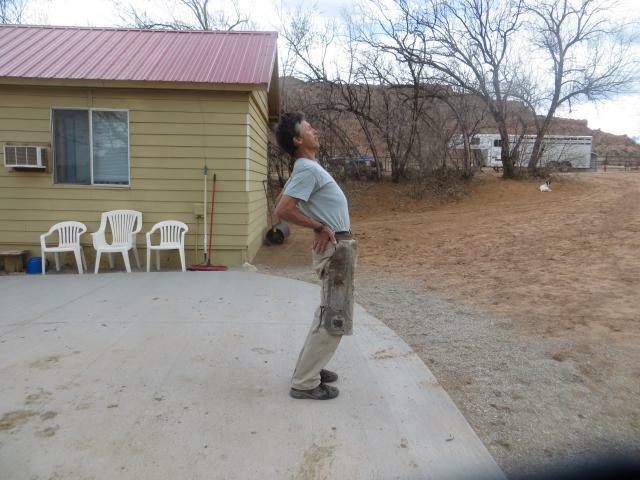 With time you will become more flexible and your back will loosen up. Do not force this stretch, work up to it as far as your body allows. The beginning plow. Start easy. Your goal is to eventually have your feet touch the ground behind your head. 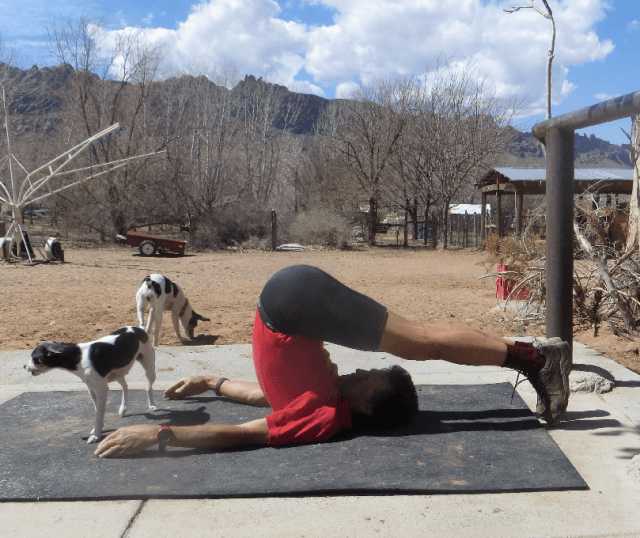 The Plow is one of the best back stretches you can do: it creates space between the discs to allow for cellular exchange. Toxins are being flushed out and you are feeling rejuvenated. Hold it for up to two minutes for maximum benefit. 4. Spinal twist and side bends round out my program. I hope you benefit from my tips and tricks for a healthy back.